After inserting the SD card the device looks for the SDRIVE.ATR file in the root directory and loads it in the special boot drive which is then made available as D1:. Your Atari then boots the control program from the D1: drive. The software offers, among other functions, mounting ATR and XFD floppy images or COM, XEX, BIN.. executables in the D1: ... D4: drives. Then Atari boots from the first drive. 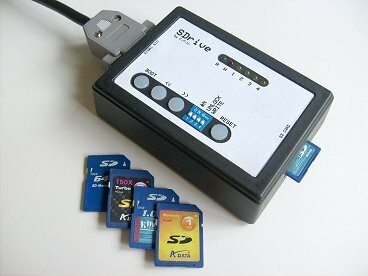 SDrive's buttons can be used to swap the contents of the D1: drive with that of the others, which allows the user to comfortably operate even multidisk games (up to 4 disks) by assigning the floppy images to the drives and swapping them with the D1: (called “system drive” from now on) when needed. System drive number is derived from SDrive ID number, so for SDrive #1 - #4 there is system drive D1: - D4:. Note: While booting the SDRIVE.ATR you can choose between loading the SDRIVE.COM control program (default), SDRIVEN.COM („NoAutoload“ version), SDRIVENH.COM („NoAutoload“ + built-in help), DOS II+ or S/XEGS RAMcart feeder of control program (SDRIVENH.COM) by holding Atari Shift and pressing keys 1 to 5.